KEF was founded in 1961 by Raymond Cooke OBE - a deeply practical man keen to experiment with new materials and technologies in order to create products with superior acoustic quality. He built the company on a foundation of quality engineering with a vision that has ensured its continued success to the present day. Following his time as a radio operator in the Royal Navy, he obtained a BSc in Electrical Engineering from the University of London and went on to join the Engineering Designs Department at the BBC where he was exposed to the pioneering loudspeaker development work of a talented group of engineers that included Dudley Harwood and D.E.L. Shorter. After five years at Wharfedale, working alongside Gilbert Briggs, he decided to set up his own company to develop loudspeakers using the latest in materials technology. KEF soon found success with products such as the K1 Monitor and the bookshelf ‘Celeste’ and, with Cooke’s commitment to strong engineering principles, developed into one of the leading loudspeaker companies in the world. 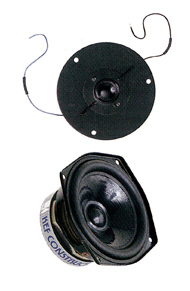 KEF became famous for the quality of its drive units, which were used in countless systems around the world, and later for significant developments in loudspeaker measurement technology. The investment required to achieve this level of technical expertise was considerable but Raymond Cooke correctly judged the logical route forward that KEF needed to take. Cooke was a great communicator and made sure that not just the engineering but the marketing of KEF products was up to his high standards. His commitment to the audio industry was visible from his support of the Audio Engineering Society, of which he was president in 1984, and from which he was awarded the Silver Medal in 1993 for outstanding contributions to transducer measurements. His contributions on a wider scale were recognised in 1979 when he was awarded the OBE by HM Queen Elizabeth II. Raymond Cooke sadly passed away in 1995 but his legacy lives on in the company that he founded. He spoke of his vision for KEF as follows: ‘I was determined to put into practice the many possibilities I could see for improving loudspeakers through more rigorous engineering’.